The countries display in this map are AUSTRALIA, NEW ZEALAND, and PAPUA NEW GUINEA. There are 5 enlarge area maps. Map with proportionally sized symbols represent data associated with point locations for Petroleum Contract Area (label with name and operator, full list in table available on reverse page), Oil Field and Gas Field, Pipeline for oil & gas, Infrastructures such as Refinery, Gas Plant, Power Plant, Tank Terminal, Port, FPSO and Platform. 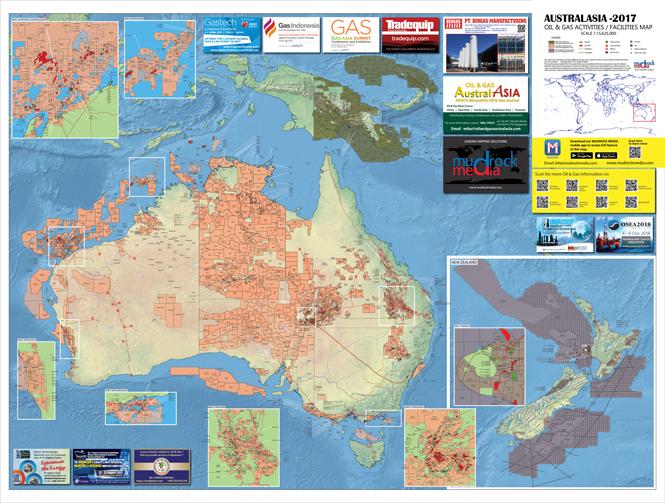 4) Map Front Cover Ad Spot A: 18.8cm width X 13.97cm height. 500 for Oil & Gas Indonesia 2017. 1,000 for other conferences and promotion activities.